In an effort to keep track of my reading, I’ve started writing down the stories I’ve been enjoying. Here’s this month’s round-up. All of them are linked, where applicable. If there’s something I’ve missed, or that I should read, leave a comment or send me a note at nanoonino [at] gmail [dot] com. Awakenings by Oliver Sacks and Asleep by Molly Caldwell Crosby. I’m researching encephalitis lethargica for novel-writing reasons, and these are the two most readily available books I’ve come across. Both are fantastic stories of medical science. Symbiont by Mira Grant. I read and enjoyed Parasite, the first volume in Grant’s new sci-fi/horror trilogy, but this sequel felt sort of bloated. It took a long time to get anywhere. Going Bovine by Libba Bray. I read and loved The Diviners, and had been meaning to pick this up. Turns out my library had it online as an audio book. I don’t often listen to audio books, so I’m not sure if the format made it seem like the beginning dragged on. I really appreciated the fully complete world that Bray built in this story, the twists and turns of the plot, and the way the story shifted between utterly ridiculous and incredibly poignant. 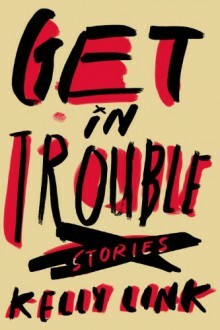 Get In Trouble by Kelly Link. I’m still reading this, and lingering over every wonderful story. Someone recently said that Kelly Link is her own genre, and I very much agree. Literary, fantastic, intelligent, self-referential… this collection is so great. “The Rainbow” by Kristen Roupenian in Weird Fiction Review. Kristen’s a classmate from Clarion, and this was one of the stories that we workshopped. It reaffirms every creepy, unsettled feeling I have about cruises. Kristen is amazing at creating tense, uncanny, and ultimately horrifying stories. “The Museum and the Music Box” by Noah Keller at Tor.com. Another Clarion classmate, another wonderful story. Noah writes delicate and evocative prose. His stories are like beautifully constructed puzzle boxes, this one especially. “The Way Home” by Linda Nagata in Nightmare Magazine. Seriously thrilling fantasy-horror, about a platoon of soldiers stuck in an otherworld, fighting off demons. I desperately want to see this adapted into a short film. “The Calf” by Vajra Chandrasekera in Three Lobe Burning Eye. Gorgeous, vividly told, and an entirely novel time-travel story. By far, my favorite thing I read this month. “The Cola of Oblivion” by Achy Obejas in The Butter. Very short, very sparse story of a dinner between relatives. Obejas manages to elude and hint at so much in a single conversation: the history of a family, and the history of a country, and the uncertain future of both. “Returned” by Kat Howard in Nightmare Magazine. Have I mentioned how much I love riffs on the Eurydice and Orpheus myth? This is a very dark one. So satisfying. “Spores” by Seanan McGuire in Nightmare Magazine. Apocalyptic fungal horror. YES. “Subcortical” by Lee Connell in Guernica. So Guernica came out with a gender-themed issue, and this was one of its offerings: the story of a research doctor’s mistress. The doctor is treating transgender patients in the 60’s, trying to cure transgenderism through reparative therapy. I’m still sorting through how I feel about this story. I think it’s thoughtful and well-told, but I felt a little let down: the trans character is very much an Other throughout the piece, ghost-like, pushed into the background of a cis-woman’s story. “The Red String” by Cassandra Khaw in Fantastic Stories. A twisted little story about a grieving widow and a mortician, with a chilling twist at the end. “A Domestic Lepidoterist” by Natalie Theodoridou, in Daily Science Fiction. I don’t know where to begin with this story about what is hidden in plain sight. It’s brilliant, the perfect length, and powerful.